Clean mushrooms and slice. Place a sauté pan on medium-to-high heat and add oil. When the oil begins to shimmer and almost smoke, add mushrooms. Then add thyme sprigs and garlic. Sauté until the mushrooms are tender and golden brown. Add salt, fresh ground pepper and a tablespoon of butter to finish. Sauté one more minute and remove from pan. Pick out thyme and garlic and discard. Set aside. In a small bowl, add the fresh chèvre, chopped herbs, salt, pepper and olive oil. Mix well using a sturdy spoon. Preheat oven to 325°F. Thinly slice the baguette and place on a baking pan. Brush melted butter on the bread and toast in the oven until crisp, but not brown, about 5–10 minutes. 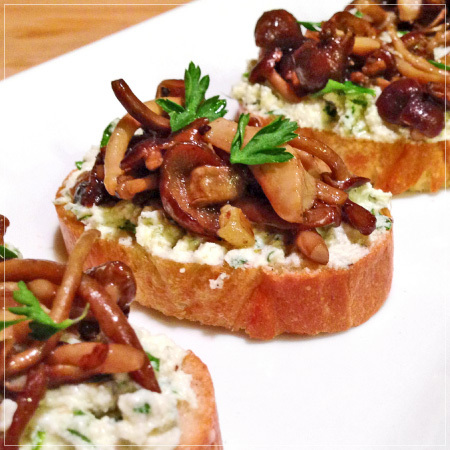 To assemble, spread goat cheese on the crostini, top with mushrooms and sprinkle with fresh chopped parsley. Serve warm.